The red 7’s, which are the wild symbols of this game, happen to appear on reels 3 and 4; a solar flare may end up covering the rest of reel it appeared on. This is done while showing beautiful graphics to you and ends up awarding whatever red 7’s are awarding you. These awards can include a new solar flare, nova, supernova or hyper-nova. If the red 7’s should appear in reel 3 a nova feature is initiated, which multiplies the prize for any wining combination it appears in with the number 7. 7 free games are awarded during which red 7’s are also added in reels 2, 3, and 4. With 3 or 4 scatters appearing during the feature, 7 more games are also added. The red 7’s may supernova if they are to appear on reel 3 after the nova feature. This means that in this game the term supernova is used for telling that the whole reel 3 will end up being covered in red 7’s with nova feature on (being multiplied with 7). If the red 7’s appear on reel 2 they may solar flare, then may hyper-nova (may cover reel 1 as well. If the red 7’s appears on reel 4, they may supernova and the hyper nova onto reel 5. 7 free games are awarded and red 7’s are added to 2, 3 and 4 during this feature. 7 free games are also awarded when scatters are appearing left to right during the feature. This also triggers an expansion of red 7’s over reel 3 and also triggers re-spin of reels except reel 3 after the pays are awarded. A hyper-nova extreme can also take its place where hyper-nova (the usual one) happens with red 7’s expanding on other reels from reel 3. 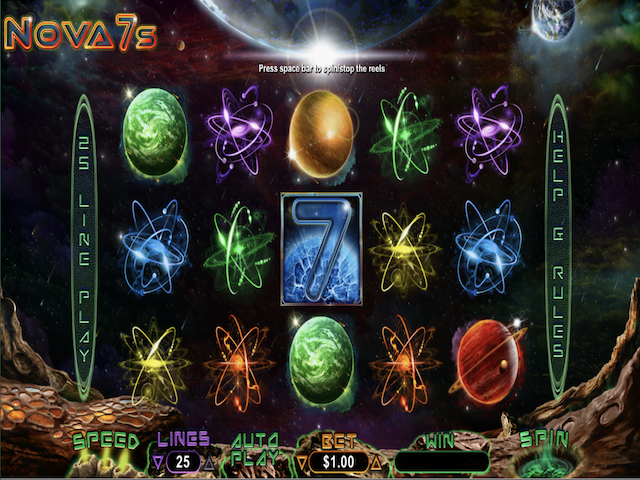 The final feature in the Nova 7s Slot online is the one of kind 4 free games feature. The scatters called blue 7’s trigger this feature, when 3 or more of them appear left to right in normal games. Touching them can lead to different features like Nova, Supernova, Hyper-nova and Hyper-nova extreme.